During Goa carnival, every year a person from the is chosen to play King Momo - a mythological character who symbolically rules the state during the carnival time and leads the float parades held across Goa. 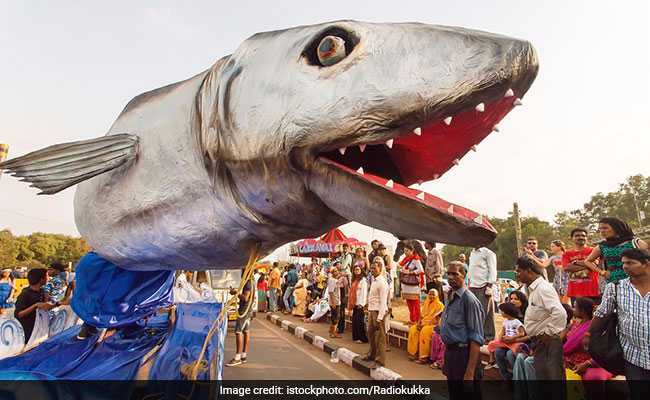 Giant shark sculpture during Goa Carnival 2017. Panaji: The popular annual Goa Carnival will be held across the coastal state from February 10 to 13. The main float parade of the festival will be held in the state capital Panaji on February 10 and 'King Momo' will lead the float parades in all the major cities of the state. Every year, a person from the state is chosen to play King Momo - a mythological character who symbolically rules the state during the carnival time and leads the float parades held across Goa. This year, Bruno Azaredo (57), from Utorda village in South Goa district, has been selected to play the role of King Momo and lead the float parades, a spokesman of the state tourism department said. State tourism minister Manohar Ajgaonkar earlier took stock of the preparations, including security and traffic arrangements, for the four-day festival. The float parades will be held in Margao and Ponda on February 11, Vasco and Curchorem on February 12 and in Mapusa and Morjim on February 13, he said. The carnival committees, set up by the tourism department, have been asked to encourage participants to promote the state's culture and traditions in the festival and minimise the commercialisation of floats, he said. "The vehicles which cause pollution will not be allowed in the parades. The consumption of liquor and carrying of weapons will also not be permitted during the event," the spokesman said. The carnival is being celebrated in Goa since the 18th century and is meant for enjoyment and merry-making, just before the 40 days of Lent, which is the time of abstinence and spiritual preparation for Easter, one of the organisers said. The festival was introduced by the Portuguese, who ruled Goa for over 500 years, he added.